Field peas in one of the variety trial plots. Dipak Santra speaks at a variety plot tour in June 2018 at the High Plains Ag Lab. 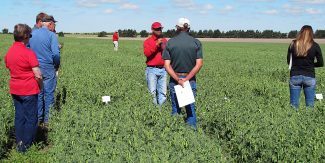 Results of 2018 variety trials for field peas are in, and have been posted on the Nebraska Extension CropWatch website. The pea trials consisted of four plots, each with between 19 and 35 varieties. They were located in Box Butte, Cheyenne, Custer and Perkins counties. All plots were dryland (rain-fed). A fifth location in Webster County near Bladen failed. For each variety at each plot, the CropWatch website report lists yield (listed according to rank); test weight; days to flowering and physiological maturity; height at harvest; and other information about the growing season and production practices at each location. The direct link for variety trial results for peas is http://cropwatch.unl.edu/varietytest/othercrops. Or, navigate to the Other Crops Variety Trials page from the main Cropwatch page (http://cropwatch.unl.edu) by clicking on these links: management > variety testing > other crops. Results for 2018 and recent years are listed on that page for both dry beans and peas, along with oats, proso millet and sunflower. Dry bean variety trial results are expected to be posted this winter, after UNL crews have finished harvest, sorting and cleaning, and data analysis. 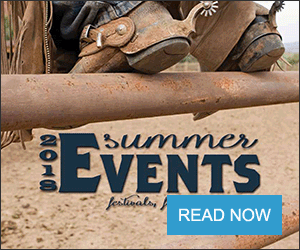 On the same web page, growers also can locate local seed dealers for each pea variety by clicking on the 2018 Seed Book, compiled by the Nebraska Crop Improvement Association. Field pea dealer listings begin on page 23 of the Seed Book. The book also lists dealers for winter wheat, oats, millet, barley, triticale, chickpea, forage grasses, turf grasses and other crops. Dipak Santra, alternative crops breeding specialist at the UNL Panhandle Research and Extension Center, coordinated the variety trials. Santra said the growing season was favorable in general. The plots in Cheyenne, Perkins and Custer counties were planted around the optimum time, the final week of March. Box Butte County was planted about one week late due to weather. 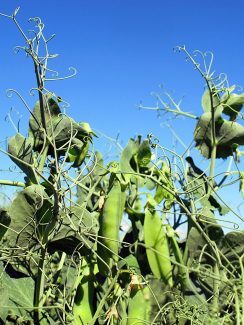 Santra noted that the Custer County plot was being planted in wintry conditions, with snow and temperatures below 30 degrees, but yields were good, showing that peas will tolerate cold spring weather. None of the plots experienced moisture stress during the season. All were harvested on time except for Perkins and Callaway. Shattering due to the late harvest in these locations lowered the average yields in these two locations, he said. The Box Butte County plot was infested by powdery mildew, possibly due to late planting and good moisture during the season, according to Santra. He said the message is that late-planted peas that receive good moisture during the season may develop powdery mildew, and many varieties commonly grown in Nebraska are susceptible to the disease. Santra said the majority of the varieties in the 2018 variety trials were from Pulse USA, Meridian Seeds, Great Northern Ag and Legume Logic, all located in North Dakota. A Nebraska company, Arrowseed, had two varieties in this year's trial. 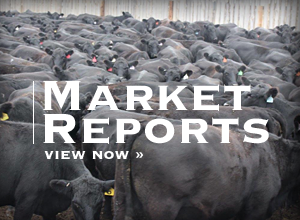 The Perkins County and Custer County trials each included one line each from a pair of companies new to the Nebraska trials, NS Seed of Serbia and Montana Integrity from Montana. The five top-yielding varieties based on averages of the two Panhandle trials were AAC Profit (Great Northern Ag), CDC Inca (Meridian Seeds), CDC Saffron (Meridian Seeds), CDC Dakota (Legume Logic) and Spider (Great Northern Ag). Inca and Saffron also performed well the previous year. AAC Profit and CDC Dakota are in their first year in the trial. All of these varieties also finished high in the statewide yield averages. Santra said interest in growing peas continues to increase among farmers. He estimated that close to 75,000 acres were planted, from the west end of the state eastward to the middle. Santra acknowledged help and cooperation of cooperators for each site: in Cheyenne County, UNL's High Plains Ag Lab; in Perkins County, UNL's Henry J. Stumpf Wheat Center; in Box Butte County, the Greg Hansen farm near Alliance; and Custer County, the Jordan Carlson farm near Callaway; and Webster County, the Tim Engelhardth farm near Bladen. Several of the locations hosted field days in June. The data were compiled by Santra. The pea variety testing project is collaborative program among several UNL specialists, educators and staff. Santra recognized contributions from Cody Creech, dryland cropping aystems specialist for the Panhandle; Strahinja Stepanovic, cropping systems Extension educator in Perkins, Chase and Dundy Counties; Vernon Florke, research technician at High Plains Ag Lab; Allison Rickey, research technician in the Panhandle; and Saurav Das, visiting scientist in the Panhandle.